A very rare small tree native to Devon in the UK, perhaps a hybrid of wild service tree and whitebeam. 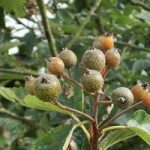 It bears large bunches of russet-red fruits, 12-15 mm (0.5-0.6”) across which are edible when ripe or after a frost, with a medlar-like date flavour. Any soil and sun or part shade; hardy to -15°C or more. ‘Devon Beauty’ is our selection, an especially heavy and early fruiter, supplied as bare-rooted grafted plants, 30-60 cm high.